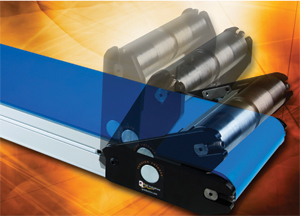 The new Automation series of low-profile belt conveyors from QC Industries, Cincinnati, OH, features the Tension Release Tail that allows for quick and simple belt changes and under-belt cleaning. It operates at the push of a button to relieve tension on the belt by quickly flipping up and out of the . The tail reseats, and reapplies tension, with a gentle push. Also, in many cases the belt can be removed and replaced without tools. The Tension Release Tail retains all tension and tracking adjustments when tension is relieved and reapplied, unlike competing conveyors, according to company officials. It is standard on all Automation-series conveyors, including AS40 end-drive and AS65 center-drive units, and is compatible with all standard QC Industries side rails and guides with flat and v-guided belts.